When looking at the combined rate of Down syndrome for the years 1998–2007, it is clear that the rate varied greatly between provinces and territories. 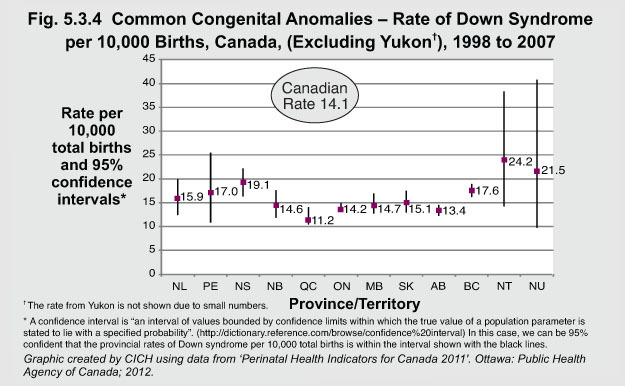 The rates of Down syndrome ranged from 11.2 per 10,000 total births in Quebec to 24.2 in the Northwest Territories. These differences may be due to a number of factors, such as differences in maternal age, the availability and use of prenatal screening and diagnosis, and the rate of pregnancy termination.